The most contemporary, high-tech bingo console on the market today! This console is the envy of bingo halls across the country. The Bel Air maximizes form with functionality. Touch screen flat-panel monitor with built-in speakers. Slant-top design for caller comfort. Standard PC technology with Windows XP Pro OS. Removable front and side panels for easy maintenance. Removable motor and base for easy maintenance. NTSC camera for live ball image. Secure cabinet design with lockable panels. Compatible with Video King's 90-Number Flashboard. Software Controlled Video Switch for enhanced multimedia control. 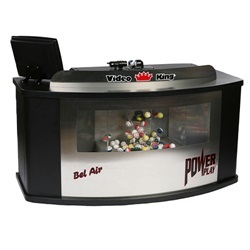 Compatible with the OMNI™ bingo management system, the e-BOS™ gaming systems, including Video King's Power Touch fixed-base systems, Campion II gaming tablet, and the full line of Video King handheld bingo devices. Supports PowerVideo software, for multimedia flashboard displays. Integrated presentation software for "in-hall" advertising. Advanced Windows-based PowerEdit game program editor. Digital image picture-in-picture for live ball display on the game screen. Easy-to-follow, on-screen directions and menus. Easy back-up of game programs. Remote access software for program changes/troubleshooting. Built in verification of all known bingo perms. Supports complex pattern definitions, including multi-level, multi-card patterns. "A" Data signal translator for connection to "A" data style flashboards. Can be configured for right or left handed callers. This product is not eligible to be shipped legally to some states. Check your local licensing and district laws. Freight costs are incorporated into the price of the item. Allow for 4-6 weeks processing and shipping. For more information please contact us @800-749-1918. This product is freight only and therefore not eligible for the Bingoshop free shipping policy.